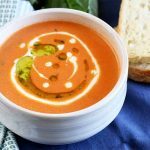 When it comes to the classic tomato soup, whether it’s a creamy bisque or even the kind that comes from a can, the flavor always seems to evoke a cherished memory. 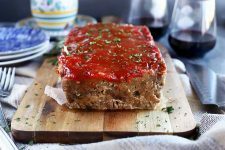 The rich flavor of tomato, the slight tinge of acid, and the mellow aftertaste is a flavor combination that is simply irresistible. And at least for me, it is the ultimate comfort food. Of course, comfort food is constantly being pushed up a notch. 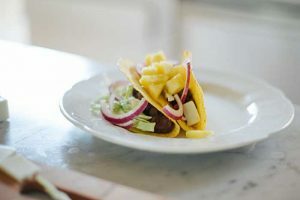 Just look at all of the new interpretations of fried chicken or steak and potatoes that you see every day in restaurants and on cooking shows. 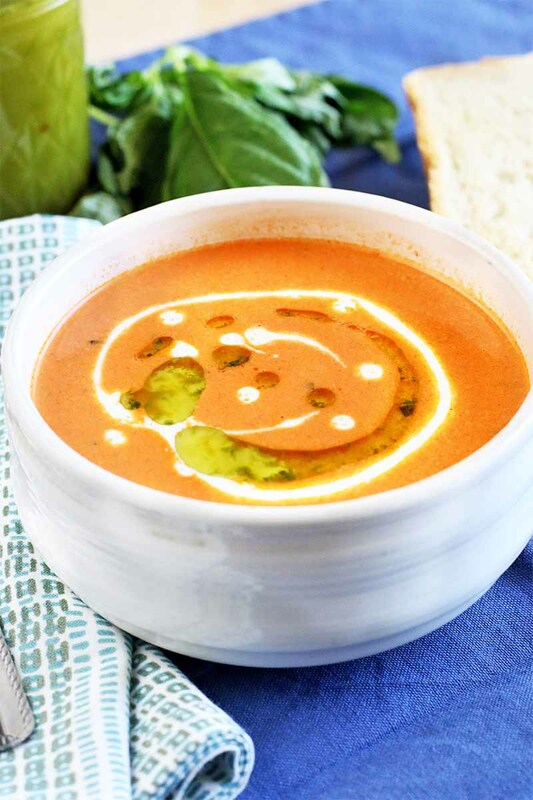 In spite of the hype, this revamped creamy tomato basil bisque is a recipe that you need to try immediately. 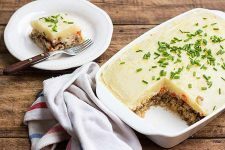 It retains the best qualities of the classic, made with fresh ingredients that fill it with the rich tomato flavor you know and love, elevated with a rich creaminess and a fresh herbaceous flavor that no one can resist. 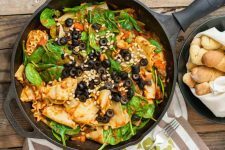 Plus, you get a bonus recipe for homemade basil oil that you can use in many other ways, and it can be stored in the refrigerator for up to a week. 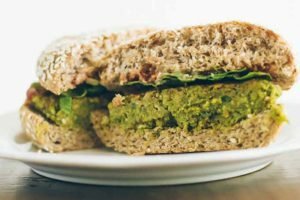 Perfect served on its own, alongside a few slices of garlic bread, or with your favorite version of a grilled cheese sandwich, this isn’t kid food – but it might spark some memories of another time, and it’s guaranteed to bring a smile to your face. 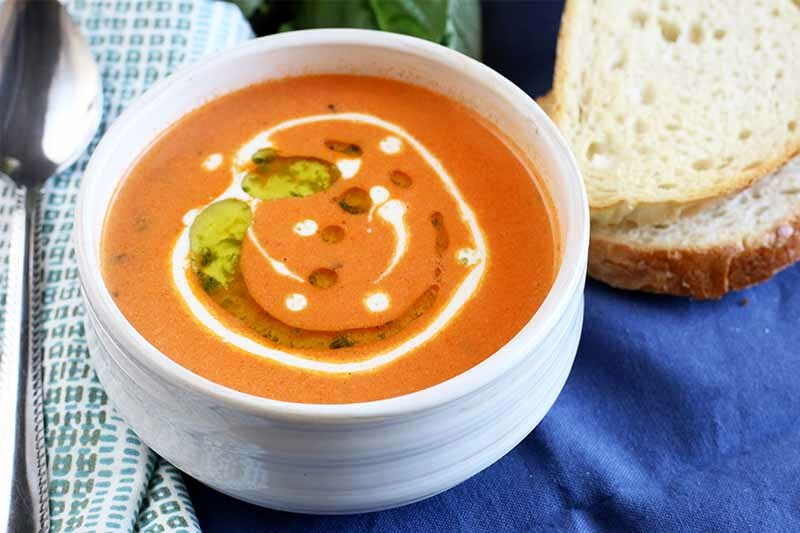 A bowl of creamy tomato basil bisque is the perfect comfort food to indulge in at the end of a long day, with a grilled cheese sandwich. 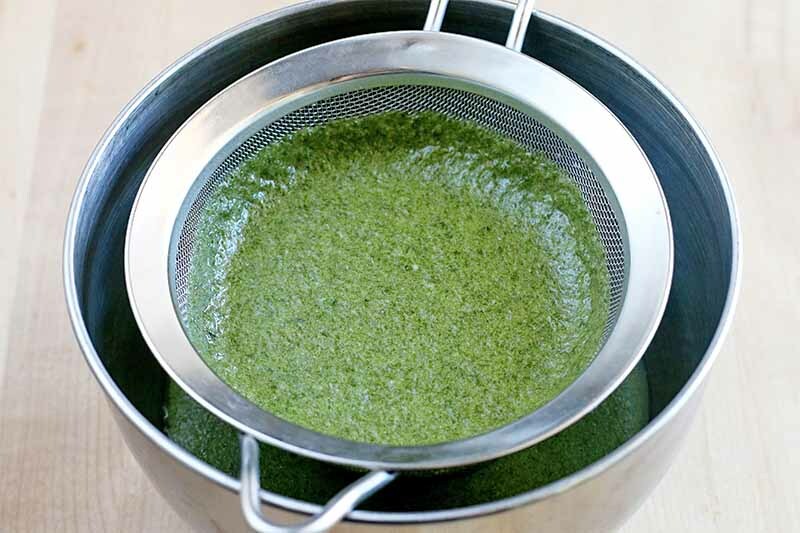 To make the basil oil, puree basil leaves together with oil in a high-speed blender until smooth. Strain through a fine mesh sieve or chinois twice. Do not press down on the mixture or you’ll end up with a bitter note to the oil. Let sit for 2 hours before storing in an airtight container. 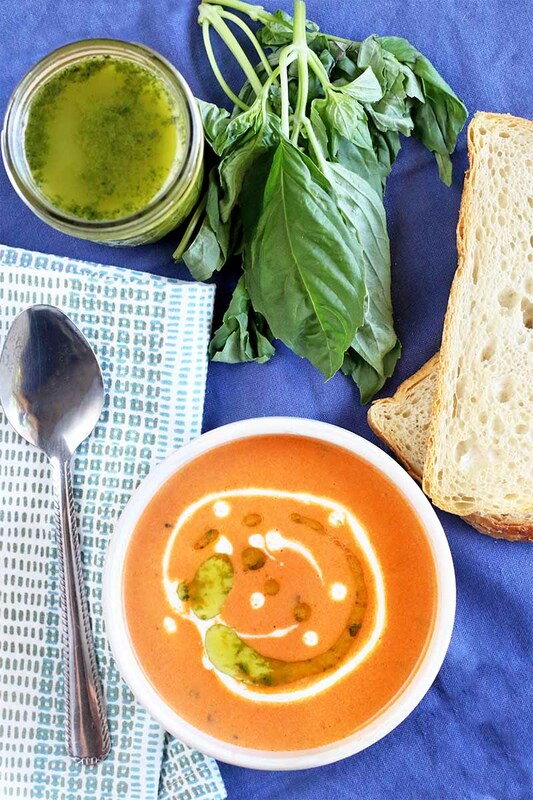 While the basil oil is resting, start on the soup. Bring a large pot of water to a boil. On the blossom end of each tomato (opposite the stem), score with an “X” with a paring knife. 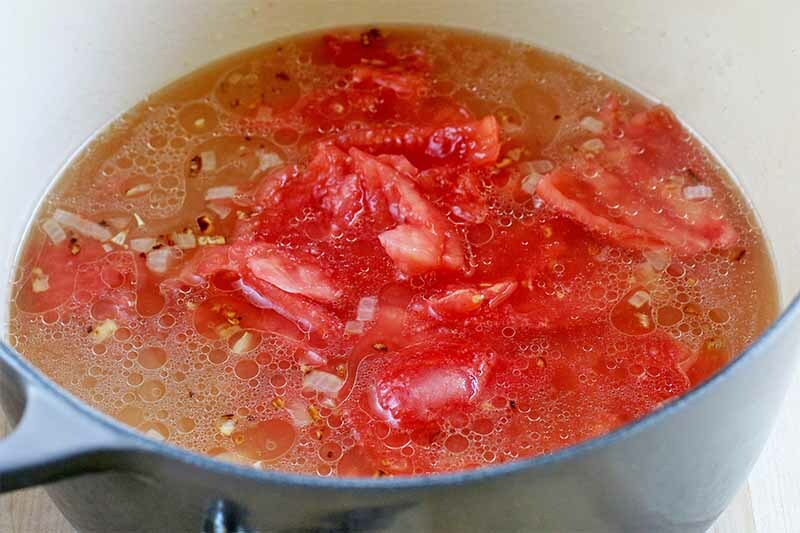 Add tomatoes to the boiling water. Boil for 30 seconds to 1 minute. Remove from the water to a bowl filled with ice water. 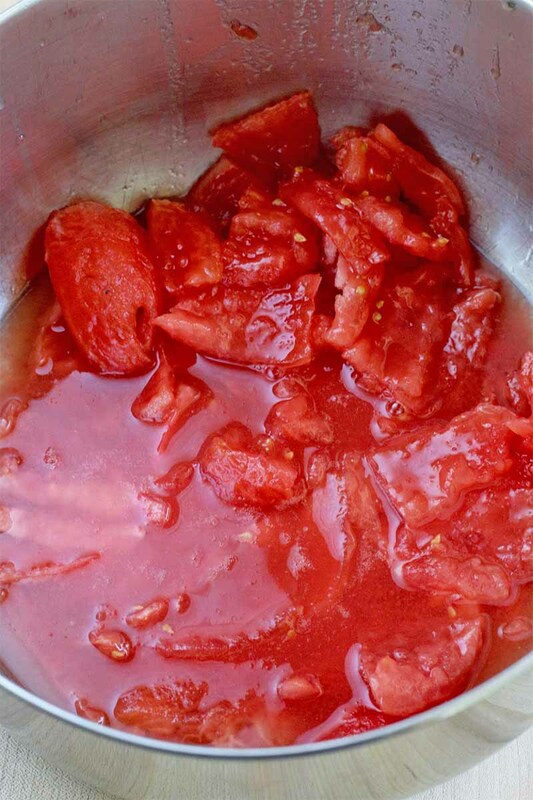 Remove the tomatoes from water and gently peel. Remove the seeds from each tomato. 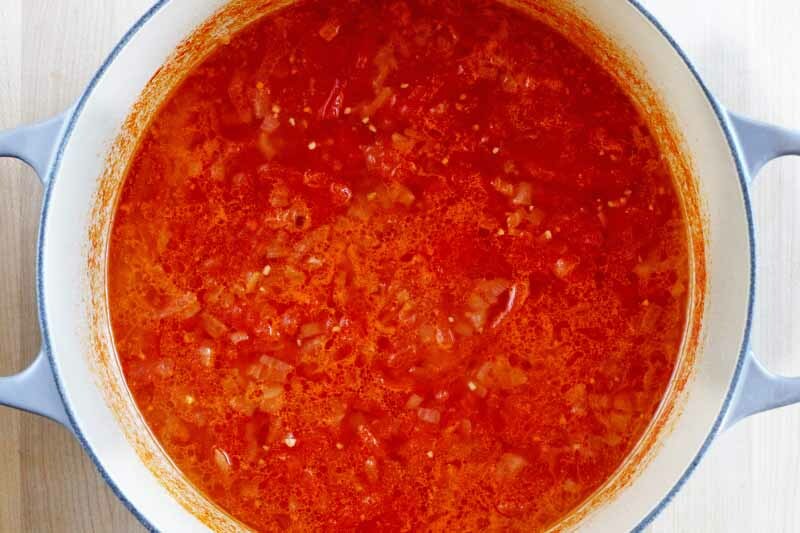 Add tomato pieces to a large bowl. 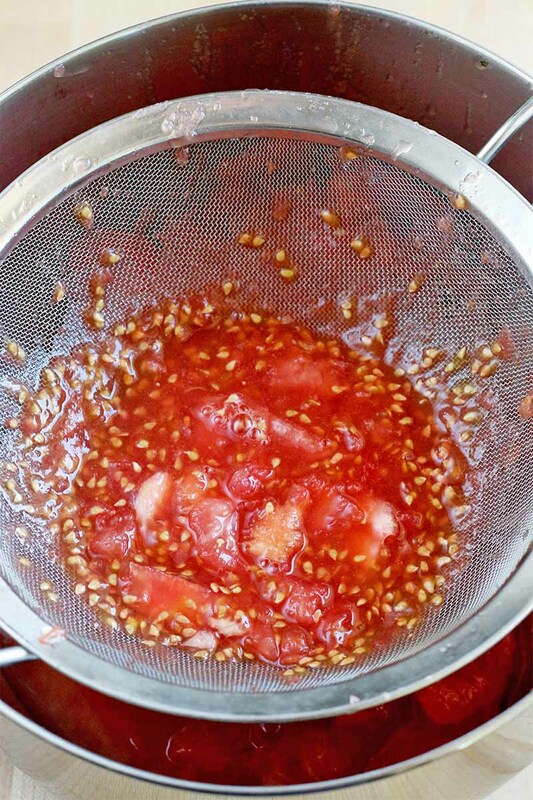 Add the seeds and goop that you remove to a sieve placed over the bowl of tomatoes. Mash the innards through a bowl to get all the flavor from those, without the seeds. Set aside. Heat olive oil in a large soup pot over medium-high heat. 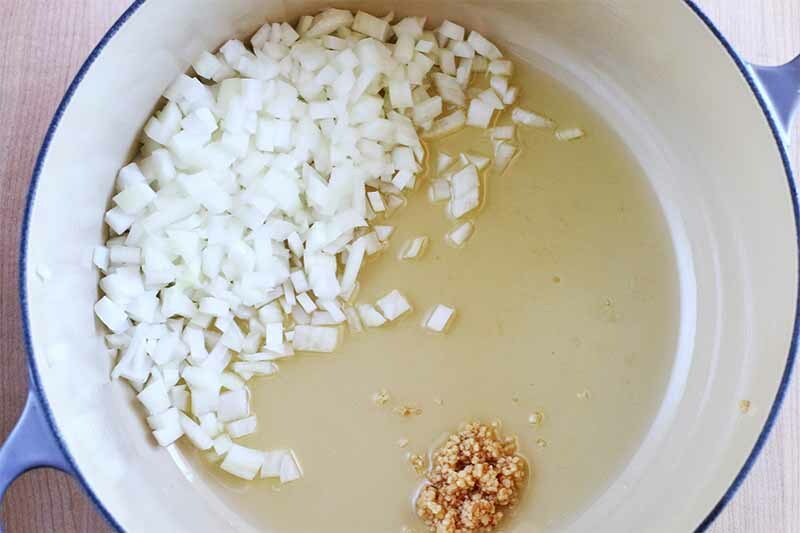 Add the garlic and onion, stirring occasionally until the onion has softened, approximately 7 minutes. Add tomatoes, chicken stock, and sugar. 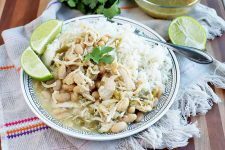 Bring the mixture to a boil, then reduce heat and simmer until the liquid reduces by one quarter, approximately 20 minutes. Turn off heat and cool the mixture for about 10 minutes. 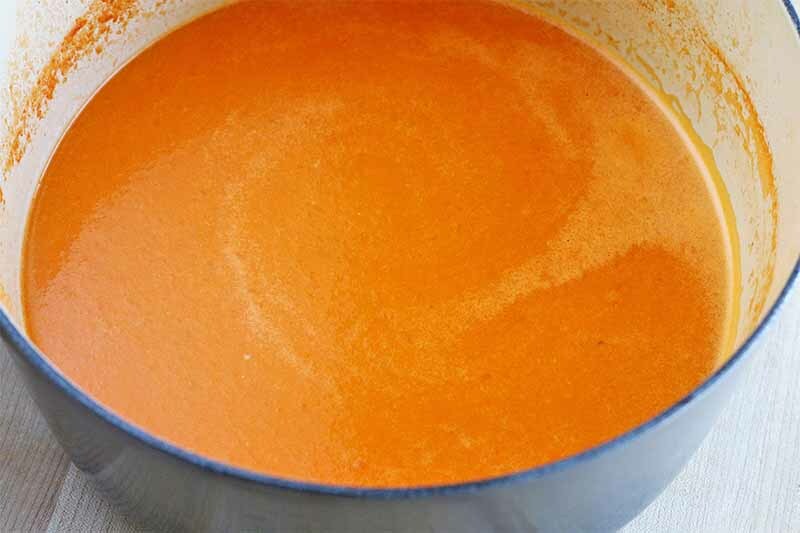 Using a stick blender, puree the soup until it is smooth. 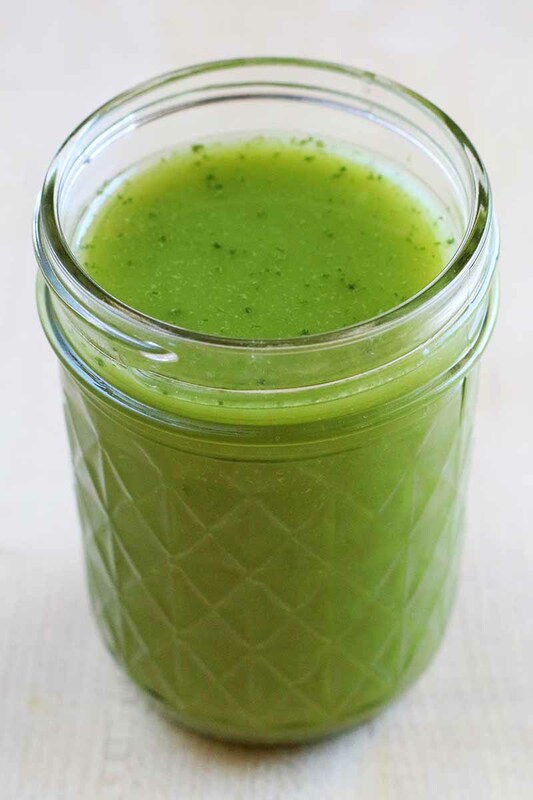 If you don’t have a stick blender, you can also use a blender or food processor, working in batches. 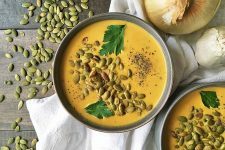 Bring the pureed soup to a simmer over medium heat, then add cream and basil. Season with salt and pepper to taste. 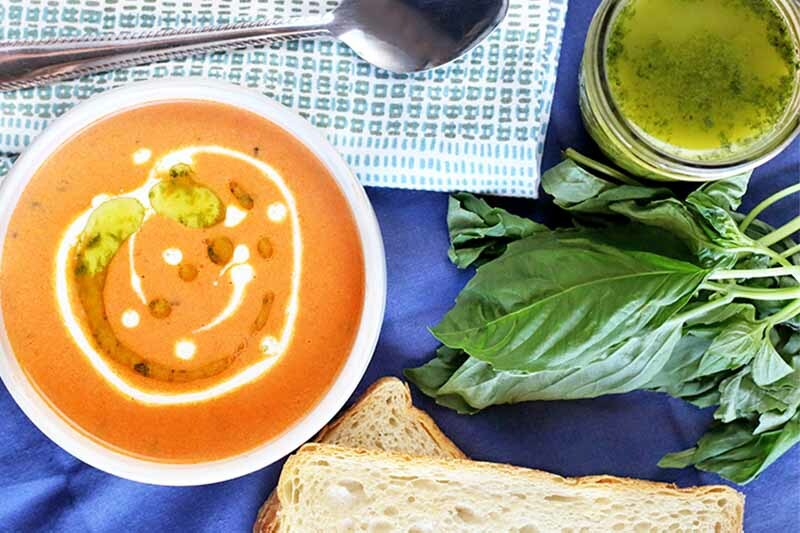 Ladle into bowls, and garnish with an extra drizzle of heavy cream and basil oil. 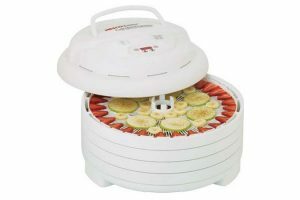 Wash all of the produce well, and dry the basil in a salad spinner, or using paper towels. Begin assembling ingredients by chopping the onion and mincing the garlic. Roughly chop the basil leaves. Measure the remaining ingredients and set aside until ready to use. Puree the basil and the olive oil together until the mixture is smooth. Strain through a fine mesh sieve, making sure not to press down on the mixture as this will allow bitterness from the leaves to seep in. Rinse out the sieve, dry it, and strain the mixture once more into a bowl. Let the mixture rest for 2 hours before storing in an airtight container. Bring a large pot of water to a boil. Fill a large mixing bowl at least halfway with ice and cold water to make an ice bath. On the bottom side of each tomato, score each with an “X”. Add the tomatoes to the boiling water. Blanch them for 30 seconds to one minute, to loosen the skins. Transfer carefully from the boiling water to the ice bath. 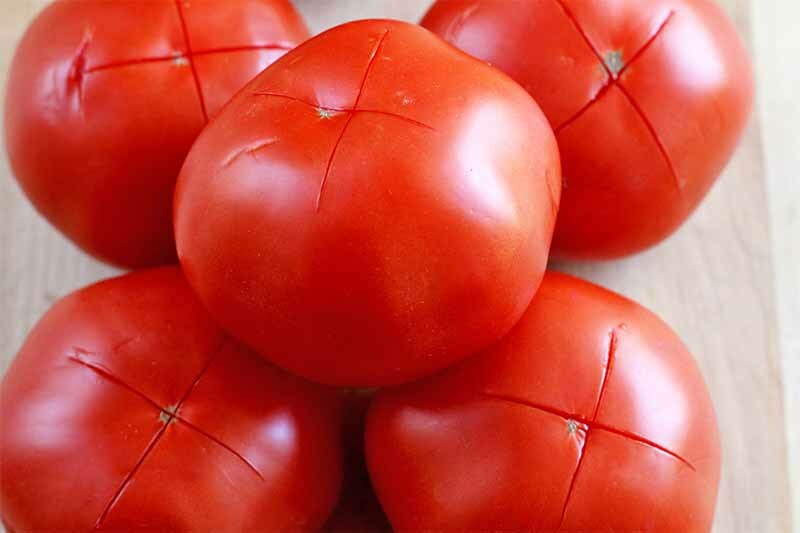 Once the tomatoes are cool to the touch, gently peel them. Cut the tomatoes in half and gently remove the seeds, reserving them along with any juice that has escaped in a small bowl. Remove and discard the cores. Add the tomatoes to a large bowl. Add the seeds and goop surrounding the seeds to a fine mesh sieve. 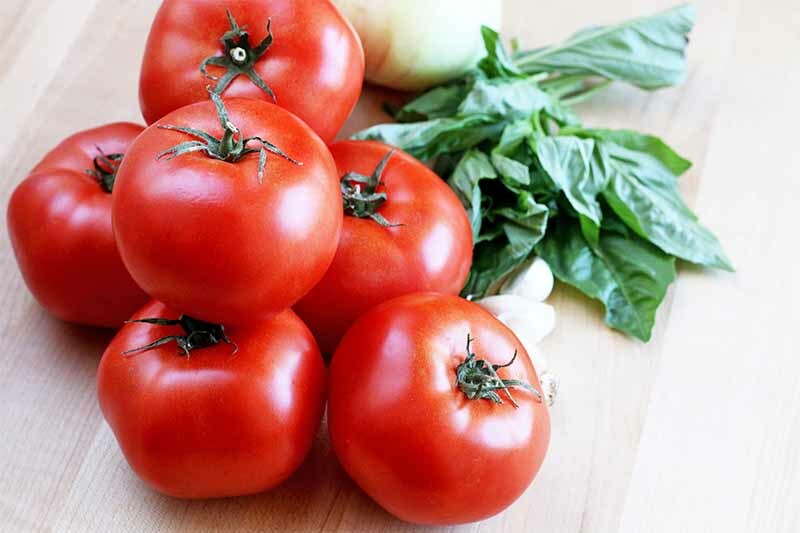 Strain as much of the juices as you can from the seeds into the bowl of tomatoes. Set aside. Heat the olive oil in a large pot over medium-high heat. 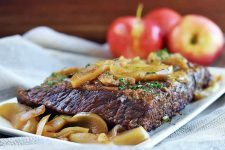 Add the onion and garlic, cooking until the onion has softened, approximately 7 minutes. 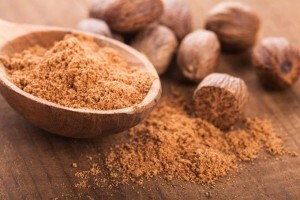 Do not allow them to brown, and remember to stir occasionally. Add the tomatoes, chicken stock, and sugar to the mixture. Bring to a boil, then reduce the heat to a simmer and continue to cook until the liquid reduces by one quarter. This will take approximately 20 minutes or so. 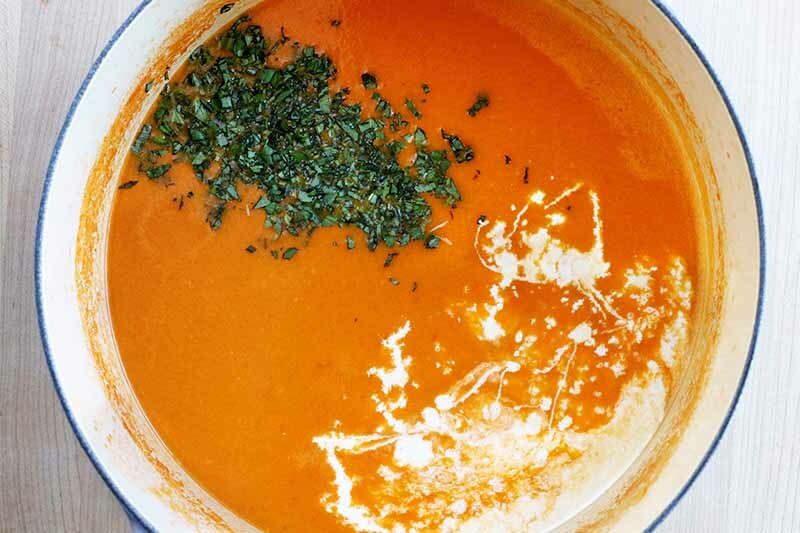 Use an immersion blender to puree the bisque until it is smooth. If you don’t happen to have a stick blender, that’s okay. 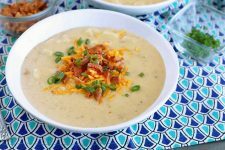 Allow the soup to cool for at least 10 minutes, and use a food processor or blender instead. 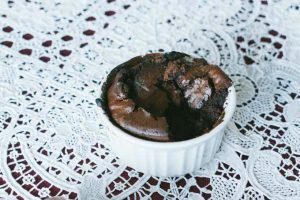 Be sure to work in batches so you can really get the mixture smooth, and avoid overloading your appliance with liquid. 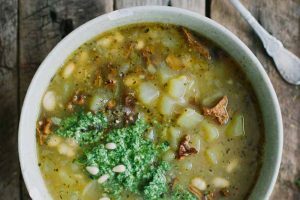 Return the soup to the large pot and bring to a simmer over medium heat. Stir in the cream and basil. Season with salt and pepper to taste. 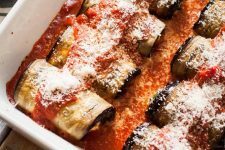 Serve immediately with a drizzle basil oil, and additional heavy cream if desired. 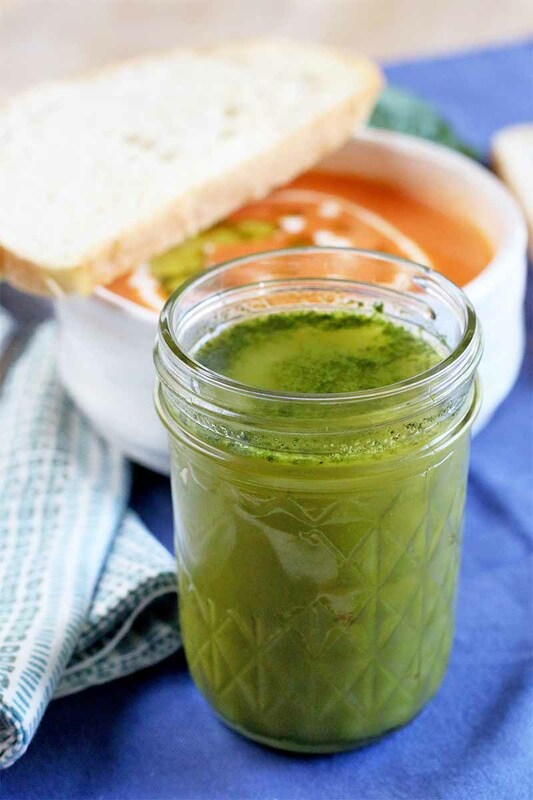 This soup is best served immediately, with toasted garlic bread or even grilled cheese! 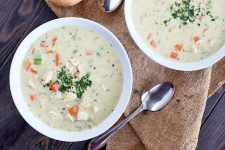 From the first spoonful to the last, this bisque is a delicious take on a classic standby, made with fresh ingredients that are so full of flavor, and that go so well together. 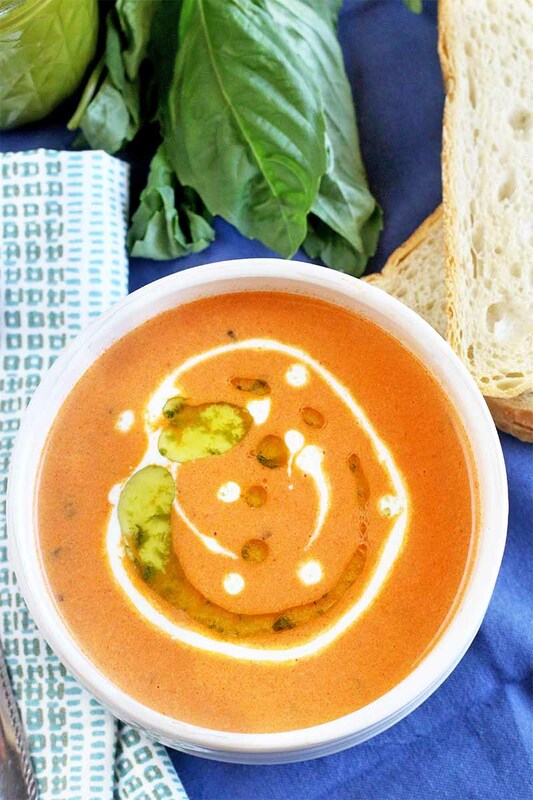 Whenever fresh tomatoes and herbs are in season, this dish should definitely be on the menu. What are your plans for the leftover basil oil? 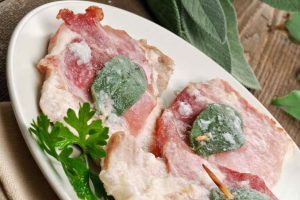 The options are nearly endless, but we have a few suggestions to get you started: try it drizzled over a caprese salad or bruschetta, or use it to coat chicken before you throw it on the grill. 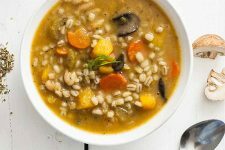 Tell us what you plan to serve alongside this soup in the comments below, and rate the recipe once you try it (because you know you definitely will). Photos by Meghan Yager, © Ask the Experts, LLC. ALL RIGHTS RESERVED. See our TOS for more details. Originally published by Shanna Mallon and Jacqui MacKenzie on September 26, 2009. Last updated: November 4, 2018 at 21:33 pm. With additional writing and editing by Allison Sidhu. 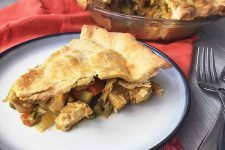 Chicken Curry Pot Pie: Add Some Spice to a Comfort Food Classic! 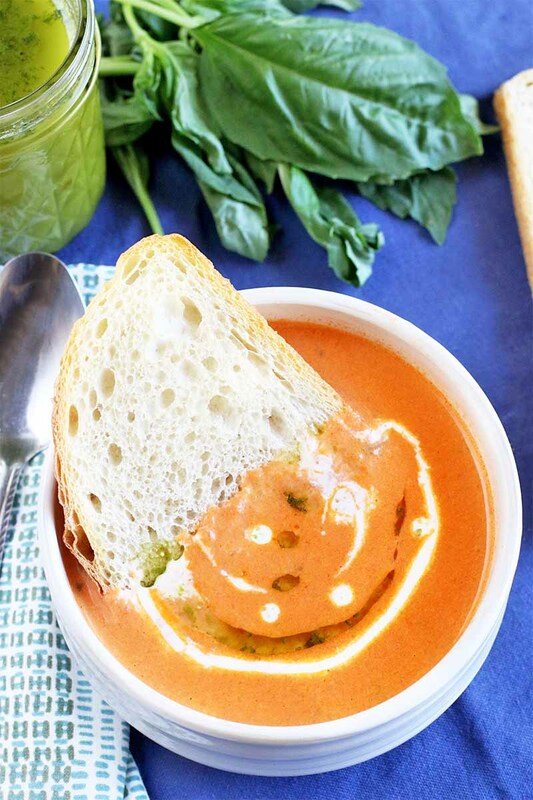 Oh man, it’s tomato soup everywhere and I’m so going to try this. Looks amazing. 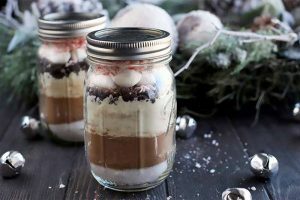 oh my gosh – i am making this NOW. 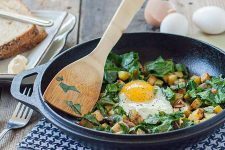 this looks fantastic – super yummy and oh so easy. thank you!! Goodness, I want to make this. Me too! 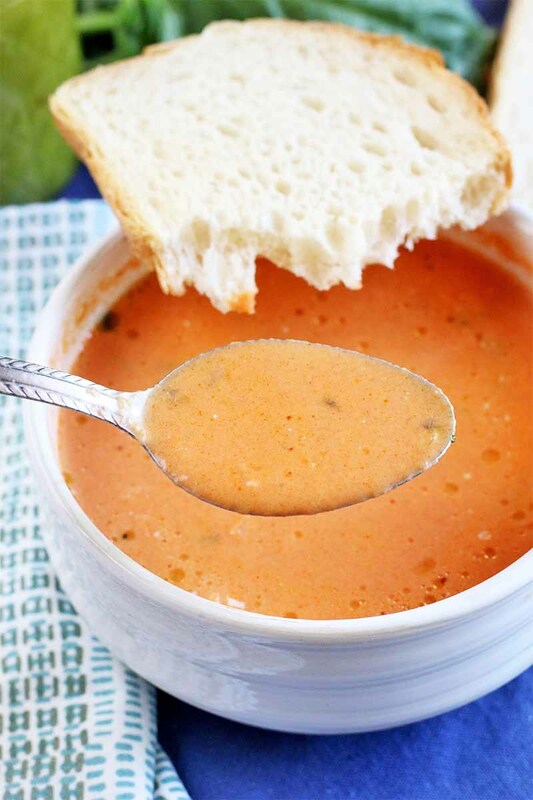 I don’t know if I’ve ever even tried tomato soup (travesty, I know), but yum.